Falafel sandwiches are my favorite things in the whole wide world! A few years, I was with my family in Dubai. For the whole week, I ate nothing but falafel sandwiches for lunch and dinner! I was in heaven. I did not need anything more! Back home, I tried a bunch of places and the falafels were obviously slightly adapted to Indian standards. Cream Center and New Yorker in Bombay are two absolutely legendary restaurants. They have been around for years & years and for a lot of Bombayites, the first taste of international food. They serve Nachoes, falafel sandwiches, pizzas, burritos, enchiladas and pastas. This is the place where I tried my first nachos, first pizzas and yes, my first falafel sandwiches. All the food here is adapted to serve the Indian crowd and it has its own unique appeal. I suspect it’s still super popular because a lot of people want to bask in their nostalgic days. My parents still talk about their samosas, Russian salad sandwiches and cold coffee. A few years ago, Lebanese and Mediterranean food became big in Bombay just the way there is a Japanese food fad right now. Never the less, I am thankful for the Lebanese food boom because now I get to enjoy my favorite foods in a whole bunch of restaurants! A lot of places the falafel sandwiches are too dry, in other places, too soggy. I am pretty sure a lot of places skip on using tahini in their hummus or use less of it, but in either case, they accompany the sandwich with some delicious sauces. One of the best parts about falafels is the yummy pickled vegetable salad that comes along with it. I still have to figure out how to make it but I was super happy with my version! I love bread, especially the smell of freshly baked bread. I had tried a few times to make bread at home and for some reason, I just could not get it right. I finally went for a bread making class where I picked up a few techniques. I always try to use whole-wheat flour and maybe that is one of the reasons I never got light and fluffy bread. Someone told me to use half all-purpose flour and half whole wheat flour instead of all whole wheat flour to give the bread a better texture. 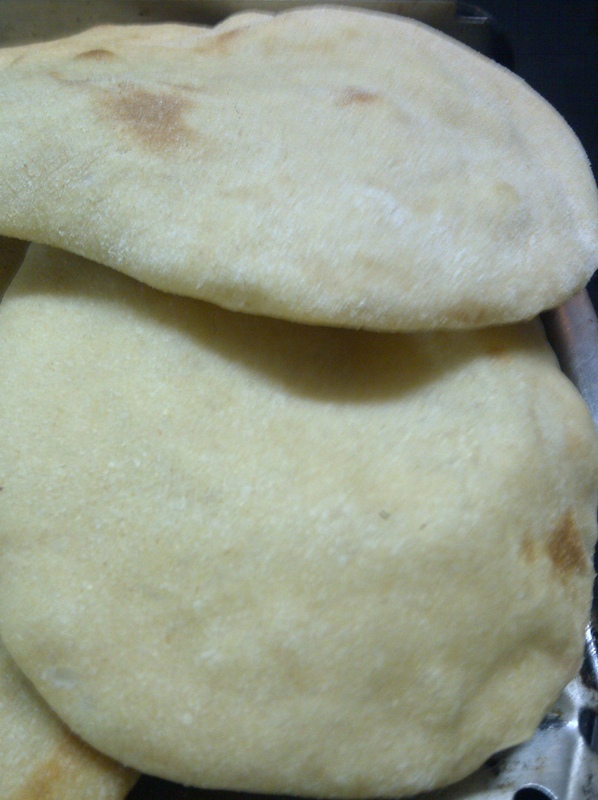 That’s exactly what I did for these pita bread and they turned out quite well. I have been looking for fresh yeast in my city, but none of the usual places I know have it in stock. So I’m using packaged yeast and am quite happy with the results. If you are using active dry yeast, follow the instructions on the packet to activate the yeast. Remember to reduce the quantity of water to be used in the flour mixture accordingly. If you using instant yeast, like me, add the flours, sugar or honey, yeast and oil in a large mixing bowl. Gradually add the water, about 1 ¼ cups first and mix using a wooden spoon until all the ingredients are well mixed. All of the ingredients should form a ball. If all of the flour does not stick to the ball, add some water gradually. Once all the ingredients are incorporated in the ball, move the ball to a work surface like the kitchen counter or a large dish for about 10 minutes. If you are using an electric mixer, mix on a low-speed for 10 minutes. The purpose of kneading is to thoroughly combine the ingredients and to break down the flour so that the dough will become stretchy and elastic and rise well in the oven. A simple hand kneading technique is to firmly press down on the dough with the palm of your hand, fold the dough in half toward you like you are closing an envelope, rotate the dough 90 degrees and then repeat these steps, but whatever technique you are comfortable using should work. When you are done kneading the dough, place it in a bowl that has been lightly covered with oil. Form a ball of the dough and place it in the bowl. 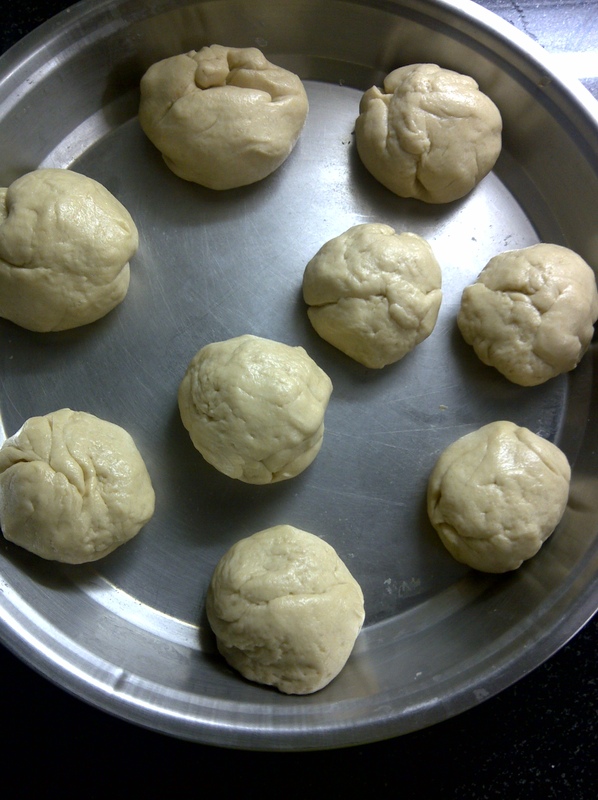 Roll the ball of dough around the bowl so that it is lightly coated with oil all over. Cover the dough with a damp kitchen cloth and set aside until it has doubled, about 90 minutes. When it has doubled in size, punch the dough down to release some of the air. Roll each piece of the dough into a ball. Cover them with a damp kitchen cloth and leave aside for 20 minutes. After the dough has relaxed, roll each ball into 1/4″ thickness. 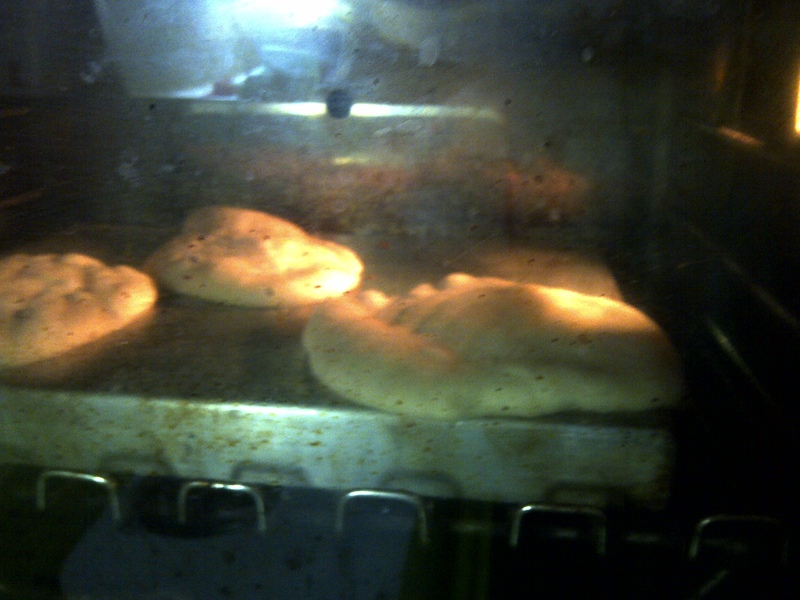 Open the oven and place as many Pita breads on the baking surface as you can and close the oven door. The Pita will need to be in the oven for 3-5 minutes. Once the Pita bread is puffed and slightly browned, its ready! Keep the pitas aside while you make the falafel. I found this recipe for baked falafels and since I am scared of deep-frying anything, I was happy to come across this recipe. While making it from this recipe, I realized it is important to NOT cook your garbanzo beans. I used to make this mistake and always found my mixture to be very wet. 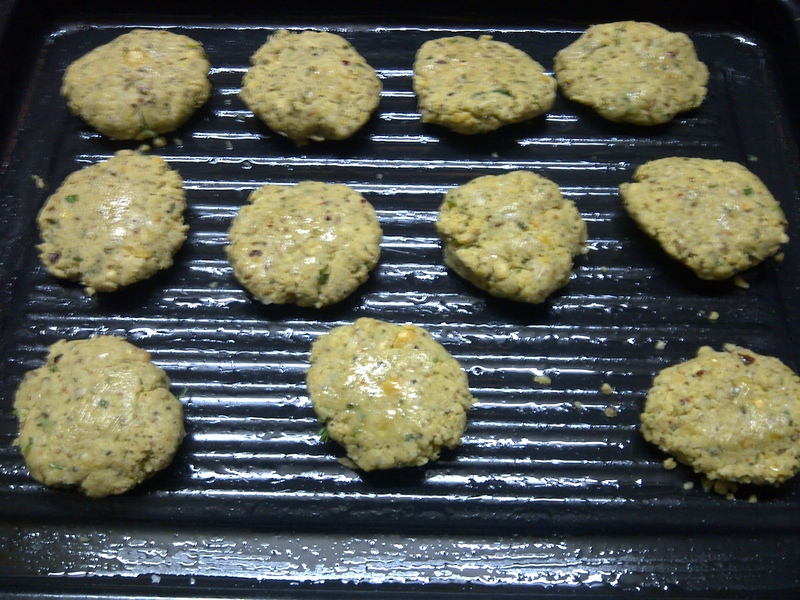 To combat that and to help me create a proper falafel bullet, I would invariably add more flour to the mix. In short, it would be one heaping mess! This recipe is much easier and the falafel bullets taste perfect right out of the oven. However, these don’t stay well overnight or if re-heated. Make this and eat them immediately in my advice! 1 cup dried garbanzo beans, soaked overnight. Drain and rinse the garbanzo beans. Put in a blender and pulse till the beans are very coarsely grounded. Put the coarsely grounded beans in a medium mixing bowl and add all the other ingredients except water. Add only 2 tablespoons of the at this stage. 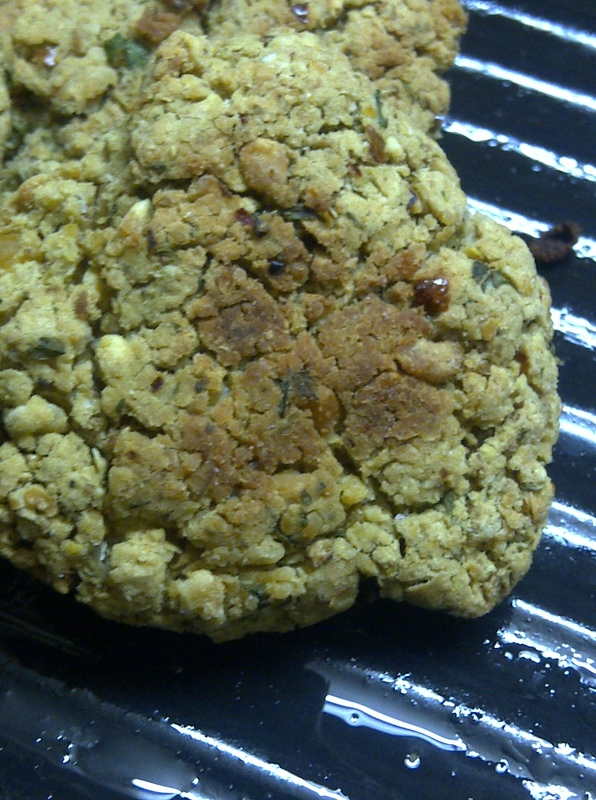 Once the ingredients are thoroughly mixed, try to see if you can make a falafel patty from the mixture. If the mixture seems to dry, add a little water, 1 tablespoon at a time. If the mixture feels too wet, add a little more flour. Once you are happy with the consistency, form small balls of the mixture, about 1½ inches in diameter. Flatten slightly. Place the balls on a well-oiled baking pan. Bake for 15 minutes on each side. With the baking process, only the side that touches the baking pan will be browned. 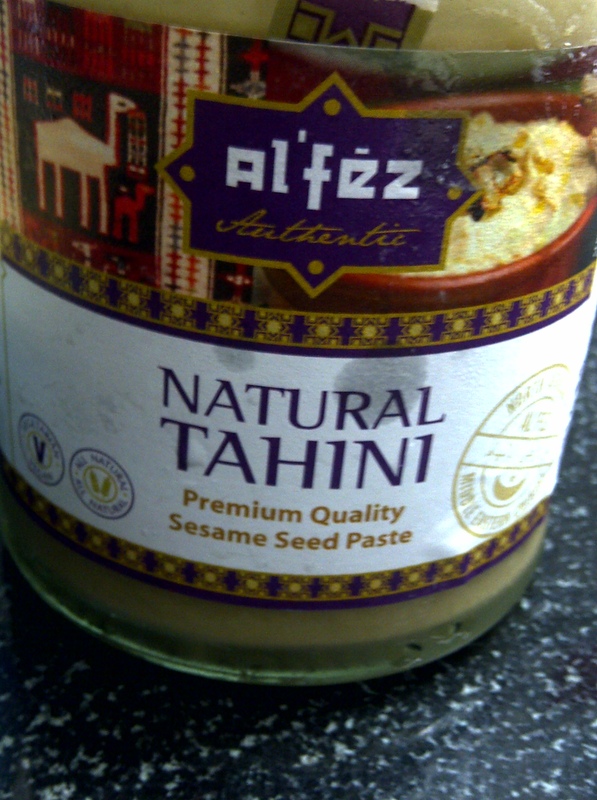 Place the tahini, lemon juice, and garlic in a food processor fitted with the steel blade. (You can also use a blender.) Begin to process. Keeping the motor running, slowly drizzle in the water, checking every now and then to monitor the consistency. When it is as thick as you want it, turn off the machine. Hummus is my favorite dip. I love the fact that it is so healthy and I enjoy eating it with some sweet carrots. Many evenings, I crisp up some pita bread and sit down happily to eat my hummus. 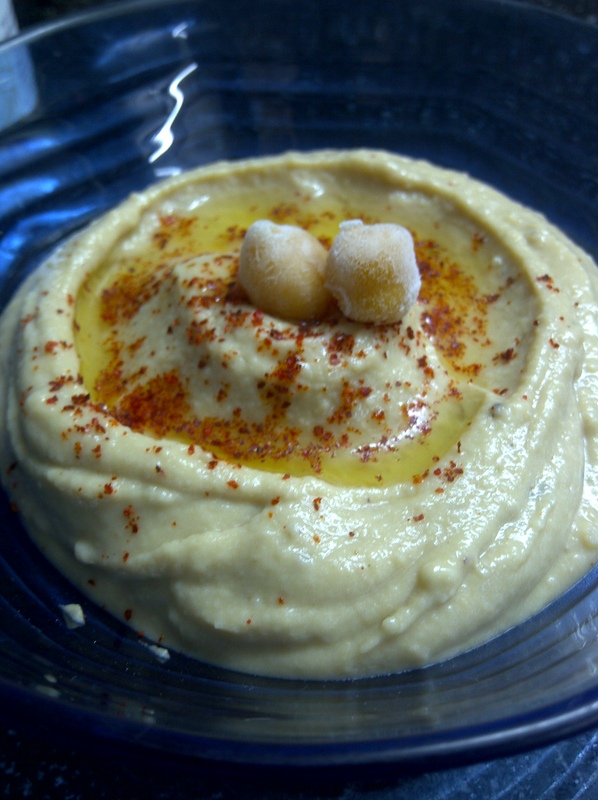 I have to confess, I love my hummus super-garlicky and that’s what I prefer to eat it all alone! Haha. 1/2 cup dried gabanzo beans, soaked in water overnight and cooked the next day. Take a pita bread and split it in half to create a cavity. Take some hummus and spread it on the pita bread. If you like, place a cucumber slice and a tomato slice with a little lettuce in the pocket as well. Finally, drizzle some of the lemon tahini sauce on the pita pocket. Your super yummy falafel sandwich is ready! I hope you enjoy these as much as I have. I know the pictures aren’t the greatest, but I think I am improving! Thank you so much for letting me know. I have looked into the issue and it has been resolved. Please let me know if you face the same problem again.